Buying and selling commercial quantities of produce is challenging with many risks to manage around supply, quality, provenance, packaging, contracting, to name a few. That is why the HiveXchange created a trust based e-commerce environment, T-ecommerce™, that uses digital technologies, workflow, data and algorithms, to manage risk and opportunity in an entirely new way. Creating a data rich search function incorporating certification and other auditable verifications that are available for review on the trading floor. Providing options for lines of credit facilities for buyers on the HiveXchange, meaning sellers can get some assurance that buyers have the capacity to pay for what they order. Managing legal risk and dispute management through a carefully constructed contracting infrastructure that is aligned with the relevant codes and trading laws in Australia. The terms on every trade cover acceptance, delivery, title, risk, and provide clear guidelines for managing disputes. 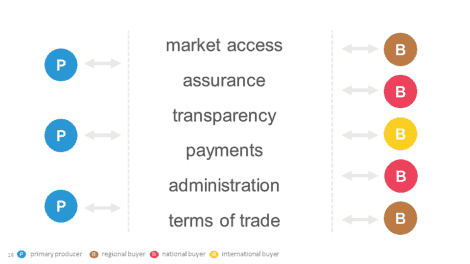 Every trade is tagged with a unique identifier associated with the buyer and seller, and with a full audit trail and storage of those trades kept in a secure and backed up environment. Risk and opportunity are being re-defined by digital technologies and ecommerce in almost every business sector. The HiveXchange is focused on bringing the commercial trade of produce into the new digital economy. T-ecommerce™ is an exciting new business model that is re-defining how businesses can examine produce and find rich trading relationships online.